Your heart is telling you to be the life of the party, but your body is screaming no. It’s hard to be in a social mood when you’re achy, fatigued, and sore. If you suffer from arthritis, chances are you have passed up many opportunities to enjoy time with your friends and family. For social butterflies, it’s hard to turn down that beach day with family, the neighborhood barbecue, or coffee with a close friend, but unfortunately it can be necessary. The symptoms that accompany arthritis can take their toll but staying socially active can help you manage and improve your quality of life. Follow these nine tips for staying socially active with arthritis. If you are planning an outing somewhere new, do some research ahead of time so you know what to expect. Find the answers to important questions about seating, how much walking is required, and if it is wheelchair or walker accessible. Be clear with your friends and family. Be up front with your friends and family about how arthritis affects you and the limitations you may have. Ask them to be flexible and explain that you will need some time for breaks. Stay active, get enough rest, and make smart food choices. Making good decisions about your health will help to keep you physically and mentally healthy, and will make time spent out and about more enjoyable. As any arthritis sufferer knows, early mornings can be rough. It takes some times for your joints to loosen up and for your body to get moving. Plan any outings for later in the morning and don’t rush yourself. Remind yourself that it’s OK if you don’t feel up to going out. However, joining an online community may help on those days when you feel confined to the house. Being a part of a tight-knit group is a great way to connect with others who understand what you are going through. Get involved with arthritis events. When you are feeling up to it, getting out and meeting others in person can be highly effective in boosting your mood. Research the arthritis events that are offered around you and choose to be a part of something that will help others – and yourself! While we know that you would love to try to do everything, be smart about the outings you decide to be a part of. Choose activities that will be easy on your joints and won’t have you feeling the pain of overdoing it. Adding a new hobby is extremely beneficial for arthritis sufferers. New hobbies can be stimulating and motivating. They can encourage new relationships and will help to provide you with a new passion for life. If a group swimming class, golf, or a walking club sounds like too much for your body, look into knitting, crafting, music lessons or starting a book club. While the benefits of being social can be great for improving your health, it can also wear you down. It’s important to ensure you are giving yourself enough to rest and recuperation time between social activities. Overdoing it can result in flare-ups or can have you feeling miserable the next day, ensuring less social gatherings in your future. Socializing and being with the people you love is huge part of your mental and physical health. Don’t let arthritis slow you down and keep you from being with the people who bring out the best in you. 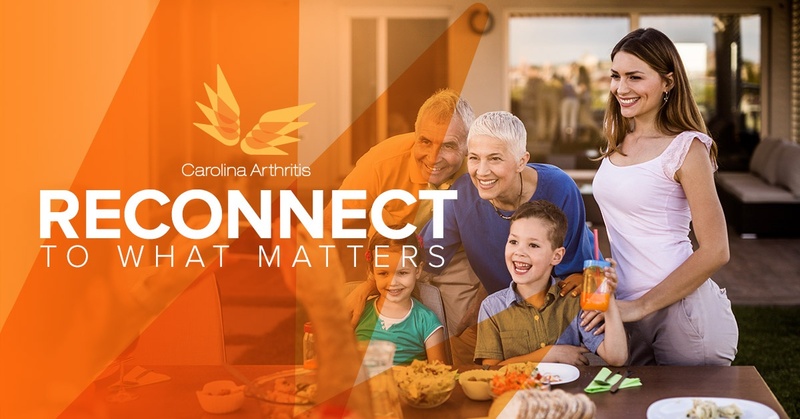 For more tips on reclaiming your life with arthritis, keep following Carolina Arthritis. If you need more ideas on staying social with arthritis, contact us today.